All ten half-hour episodes are streaming on Prime. I generally liked it. It felt like season 1.5 did and not like season 1.0 did. I see Amazon's following the Netflix model of promoting their shows by...not promoting them. Okay! I'll check it out after Sabrina. Did you guys know there's new episodes of Sabrina? Probably not. How would you?! Have only watched the first episode of S2 so far. Also was unaware that it had dropped except I was browsing for something to watch after S2E1 of Barry, because my cat is embedded on my lap and how can I disturb her? Curious to see where this season goes. 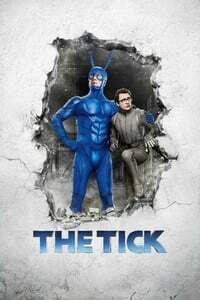 Was worried that nobody could replace Patrick Warburton as The Tick in live action, but Peter Serafinowicz's Tick by way of Adam West works really well. Just finished Ep 6 and so far this season is delightful. Without giving too much away, episode 4 is the one in which a boat made me cry. The series “villain” is suprisingly moving too. AEGIS headquarters are undoubtedly suspicious, but also a good hang. The image of Superion in earth orbit checking his social media and going bonkers is indelible. Everyone has depth and is also perfectly silly. I think it’s the kind of absurd minor show that will turn out to sit in a sweet spot in many peoples’ hearts, the may more major shows do not. I really really dig this show. I was a huge fan of the animated series back in the day (and to a lesser extent the comics) and I feel like this show has captured the vibe of them without being a simple re-tred of the stories. It's just absurd enough to be "Tick"y but also has a grounded feel to it...if that makes sense. I hope Amazon continues making it. I'd watched the first season and liked it more or less, then watched and loved the 2001 version, and I can't go back to this new one after trying this episode. The sadness covers everything. I feel like Tyrannosaurus Rathbone was a Bruce Campbell character without a Bruce Campbell. You know, there would be way worse things to have on your tombstone than: "Ben Edlund -- He Had a REEEEEEEEEEEEEALLY Good Idea Once". I had been thinking Ty Rathbone was played by Marshall Bell but I was wrong. Bruce Campbell could've done a great job. Valorie Curry/ Dot has been an interesting transition, and Curry really buys into the show's ethos. The entire cast is great, really. Serafinowicz and Speiser have been strong right out of the gate, and Tudyk's voicework is in top form. Martinez is a wonderful foil. Bell - to me - was channeling a poor show's Nic Cage.